Green tea benefits: one of the best medicinal plants for health maintenance, effective for over 60 illnesses. Variety and preparation methods are key. In this order, we will expand on each one of these points according to the latest findings. The benefits of consuming green tea of course depend on the composition and concentration of the ingredients. Since the individual varieties of green tea differ significantly, they each have different workings in the body. Here the respective quality of the tea plays a major role. Laboratory analysis has shown that teas of a better quality contain a significantly higher concentration of active ingredients and provide a more harmonious balance. 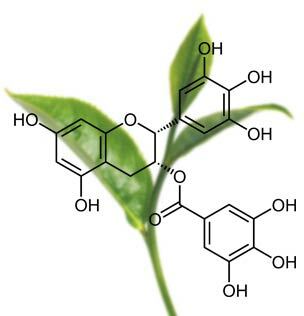 Due to the fact that most scientific studies focus on the catechins in green tea, this sometimes leads to the impression that the most important factor in green tea consumption is to absorb as many of the main catechin EGCG as possible, selecting a particularly strong green tea variety containing catechins and optimising the preparation method accordingly. However, this approach is usually misleading. High catechin doses are only useful in combatting particular diseases; in certain contexts, they can put strain on the body. In a normal infusion and when prepared moderately, good green tea qualities provide absolutely sufficient, beneficial amounts of catechin. The main focus in the selection and preparation of teas should therefore be on the application. In most cases, a certain combination of basic varieties is sufficient as tea and is even the ideal health option (see section 2: The Ideal Green Tea Basic Package for Health). An important note here is that each green tea variety is cultivated with different seed varieties, the most common being the delicious cultivar Yabukita. However, each seed variety has different contents and characteristics. For example, only a few seed varieties such as Benifuuki, Okumidori and Yamakai possess the special methylated catechins. It is therefore very advantageous to drink different types of teas alternately. Another important factor is the bioavailability of polyphenols in the tea and their absorption. These strongly depend on the form of ingestion (powder, infusion, capsules, etc. ), on the preparation (temperature, brewing time, dosage, etc. ), but also on accompanying factors such as inhibition or promotion of ingestion by other substances (e.g. milk, lemon, catechins). You will find more detailed information on tea preparation below. In order to use green tea successfully, it is vital to understand that a large part of its special effect does not result from the individual tea ingredients, but from their complex interaction with each other and in combination with different varieties. This has been shown in studies which, for example, found a particularly positive, complex function of caffeine when combined with the amino acid L-theanine; or which demonstrated that the effect of certain catechins when combined together is more effective than the intake of individual catechins. Accordingly, it is worth considering the individual varieties, qualities and combinations of teas, as well as the best preparation for your individual use. This also means, however, that the full effect of green tea only comes to fruition when different varieties are selected and combined in a targeted manner throughout the day and week. Two of the most frequently asked questions about green tea are firstly, which tea combination is most beneficial for treating particular diseases due to its ingredients; and secondly, what is the best comprehensive green tea health package (the best combination of teas for basic care and daily prevention, as well as the best combination for mild diseases and a weakened constitution). 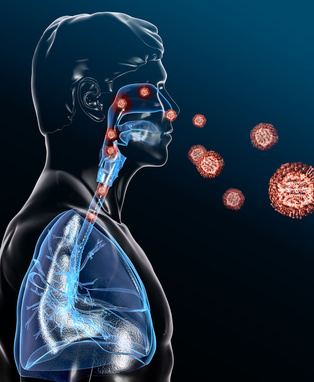 The first question has to be answered according to each individual disease – see section 3. Here we will address the second question. As a daily, basic provision of green tea for prevention, mild illnesses and a weakened constitution; as well as for improving fitness, the metabolism and achieving an ideal weight, the following basic package is very effective. It consists of the most important green tea varieties – Gyokuro, Sencha, Bancha, and Matcha – whereby the contents and main effects of the varieties complement each other extremely well throughout the day. The caffeine content in this package can also be classified as very health-promoting in adults, as it causes much less harm than coffee, buffered by amino acids (L-theanine) and bound to tannins. With a total of about 210 mg per day, prepared at a recommended temperature of 55°C with a 2 minutes brewing time (for gold quality/super premium), it is still well below the critical limit of 300 mg for unbuffered caffeine. In comparison, two cups of Robusta coffee contain about 230 mg of caffeine, which are completely unbuffered without L-theanine and tannins. On days when one has an additional portion of Matcha, the caffeine intake is increased by 68 mg with two bamboo spatulas of powder, or 136 mg with four. Experience has shown that it is much less effective to select just one suitable tea based on its main biological workings (as given in the table below). The combined effect of the 3 or 4 different varieties of the basic package facilitates the tea’s positive effects on individual areas, as well as on the body as a whole. Many health problems are based on very complex causal connections. From a naturopathic and holistic point of view, it is therefore essential to identify as many causes as possible and to try to remedy them gently and harmoniously. The order of the recommended intake of the basic package also takes into account the caffeine content, or rather the tolerance and general absorption capacity of the respective contents by the body. Note: the quantities of ingredients listed depend strongly on the individual tea and its quality. The table refers to high quality teas (from super premium/gold). Due to the consumption of the whole tea leaf ground into a powder, the amount of contents in Matcha is much higher in absolute terms than is the case when leaves are infused in regular tea. If you look at the three most important green teas listed above, you will notice that their biological effects cover every area of the organism in a very gentle and yet effective way. In our experience, improvements to general health occur between a few weeks and a few months of drinking these teas regularly – depending on the constitution and existing problems. We have already received the most astonishing reports; the powerful yet gentle benefits of green tea are always surprising. Due to its special properties and intake, Matcha should be regarded as an extremely important addition to the basic package. In Matcha all the tea contents are consumed at full strength in the ground leaves and are not just released into water, as in a regular tea infusion. Matcha therefore delivers a much larger total quantity of many ingredients. This fine green tea powder is regarded as one of the most effective detoxifiers for the body and as the strongest antioxidant. In a society in which the environment, water and food are heavily polluted by toxins and other pollutants, the regular intake of Matcha cannot be overestimated. At the same time, it should be kept in mind that mobilising toxins in the body does not immediately solve problems, since then these toxins must be removed quickly by the excretory organs. To this end, it is essential to provide basic support to the kidneys with Gyokuro, liver with Sencha and intestines with Bancha. Here too, the combination of all four teas is highly advantageous. Due to the much higher intensity of Matcha, in most cases it should not be consumed more than 2 to 4 times a week, otherwise it can put strain on the body. The >>preparation of Matcha<< should be done in the traditional way, with the use of a Matcha bowl (Chawan) and hot water between 70-80°C (depending on the quality). A special Matcha whisk made of bamboo (Chasen) is, from experience, essential and of great help in obtaining a tasty Matcha. 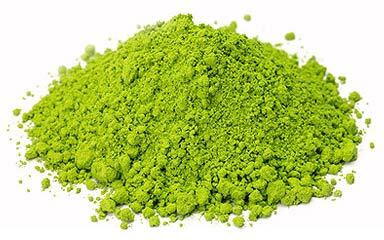 Furthermore, it is very healthy to add unheated Matcha to a shake or smoothie and so to consume the tea powder (unheated) 1-2 times a week. Beside the above-mentioned four most important types of green tea, there are further varieties that have very specific and beneficial effects and contents. The main varieties are Sencha Fukamushi (deep steamed), Shincha (like Sencha, but first spring tea – advantageous as an early summer treatment), Kabusecha (half shade), Gyokuro Karigane and Sencha Karigane (tea made from the plant stems, hardly any caffeine and a lot of amino acids), Genmaicha (with roasted rice, for warming up on the inside on winter evenings, sometimes mixed with Matcha), Benifuuki powder (special catechins) and Sencha powder (particularly strong). For those who wish to really take pleasure in their health, we recommend purchasing all of these teas as a complete package, integrating them into your weekly green tea plan. Plus, the total costs are not higher, since the individual teas are consumed less often. Experience shows that the more specific effects of these teas significantly exceed those of the basic package and also offer important variation in taste and health effect. In Japan, the very first green tea harvested in the year called Shincha is highly prized for its special contents and its incomparable taste. In principle it is a Sencha, except that only the first, most tender leaves of the year are used and the tea is brought to the consumer as quickly as possible. Every year there is a rush to the traders for this tea and the prices are sometimes extraordinarily high. As a result, the best Shinchas are often rapidly sold out. 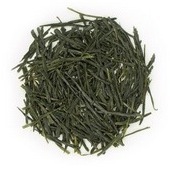 Shincha is the ideal tea for an early summer treatment course, from the months of May to July. 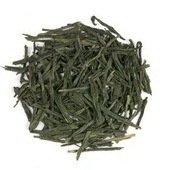 In the heat of summer, Mizudashi is a very popular green tea. It is specially produced to release as many ingredients as possible when brewed in cold water (in a glass carafe in the refrigerator). Although such cold tea infusions are not as effective as normal hot infusions, they produce an extremely refreshing, summertime taste, can be stored for longer and can be easily transported on the move. Hot tea infusions, in contrast, should be drunk shortly after preparation, as otherwise important ingredients deteriorate. Whilst many people believe that they must consume as many of the valuable contents of green tea as possible; our experience has lead us to believe the contrary. As a general rule, the most important thing is to achieve a sufficient amount of catechins (especially EGCG) and amino acids (especially L-theanine). In addition, regularity plays an important role, as well as obtaining the right combination of teas throughout the day. This stimulates the body in a better, more harmonious way, provides a completely sufficient supply of tea nutrients and is generally more effective. The same applies to almost all other ingredients in tea. The above-mentioned basic package already provides a valuable supply of the individual substances in tea, as well as of the secondary substances, which are not to be underestimated. It is sufficient for most applications. Study and medical reports of high doses of EGCG should be analysed in light of the purpose of the study and the severity of the disease. For certain diseases, it is absolutely beneficial and important to consume higher amounts of EGCG and certain types of catechins. This will be discussed in further detail in section 3. For daily basic care with the basic package this does not apply. Readers may have noticed that the basic packages above contain only Japanese green tea varieties. However, the most widely available green teas come from China, India, Sri Lanka and Africa. This recommendation is simply based on the fact that these Japanese tea varieties are gently steamed, while most other green teas are heated or roasted in a pan. Gentle steaming has a major advantage: it maintains the effectiveness of many of the tea’s contents. However, teas from these countries also exist that have been produced by so-called “baking” or drying in the sun and air (as with white tea). Although baking is less gentle than steaming, it still achieves acceptable results from a health perspective. Furthermore, sun/air drying – especially of white teas – produces its own specific beneficial effects. Although countries such as China, India and Sri Lanka often have an advantage over Japanese tea farms due to their climate and soil conditions, our experience is that most Japanese teas achieve considerably better health results due to this perfected processing. Radioactive exposure from Japanese green teas since Fukushima? The concern of many consumers about possible radioactive contamination from Japanese green teas is significant and somewhat understandable. However, in discussions with two of the four largest laboratories in Germany specialising in tea analyses, we were told repeatedly that no increased toxicity was found in any Japanese tea samples. What is more, most of Japan’s best tea farms are located very far away from Fukushima and in the opposite wind direction. Tea produced in regions closer to Fukushima is not allowed to be exported or imported without laboratory testing, and customs inspect every commercial import. In addition, random samples are taken repeatedly from all imports, through which it is easy to recognise early warning of possible toxicity in entire growing regions, in order to then tighten controls in a critical case. Consumers who nevertheless remain suspicious should buy from retailers who test imported batches in a laboratory and publish the test report. For many retailers this is, of course, considerably expensive. 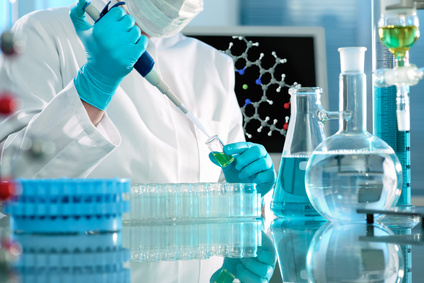 The standard laboratory test checks for a value of 50 Becquerel, whereby the official limit is 500 Becquerel. In this context, our experience is that fortunately no problems with radioactivity from Japanese teas have arisen so far. In contrast, consumers ought to be more concerned about the exposure of teas to pesticides and mineral oils. This applies above all to green teas from China, India, Sri Lanka and Africa, but also to poor quality teas from Japan. Again and again such teas are clearly polluted with chemicals. Unfortunately, this also applies to certified organic teas. The widely used herbicide, glyphosate, is very often applied to these teas and is one of the most popular substances worldwide (also in European agriculture). It cannot however be measured by the usual multi-method and consequently tests for glyphosate must be carried out separately and are very expensive. Thus, very few laboratory tests are published by retailers. If one addresses this topic with leading laboratories worldwide, it becomes clear that this is a very serious problem and one in which consumers should be concerned, also in regards to organic teas. The effect of the preparation of green tea on the composition of its contents is a whole chapter in itself. The longer the infusion time and temperature, the more the important ingredients – such as catechins in particular – dissolve into the water. At the same time, more and more undesirable substances are added to the infusion above a certain amount, such as specific tannins and caffeine. In addition, a higher temperature has a detrimental effect on many beneficial substances such as certain fats, vitamins, amino acids and oils. Experience has shown that for most green teas in the basic package, the optimum temperature and brewing time is 50-60°C (depending on quality) at 2 minutes, with a single infusion. The use of the right utensils also plays a significant role e.g. a tea strainer with the right filter size or a Japanese teapot with an built-in strainer (Kyusu). Further details and links can be found in section 7 below. The final important point to make in this chapter is on the effect of water on the workings of green tea: in any case, a sufficient amount of fresh, still water should be drunk daily. Among other things, this is vital in aiding the detoxification products, regularly produced by green tea, to pass through the body. The basic rule is that you should drink at least 30 ml of fresh water per day per kg of body weight (for 70 kg, about 2.1l). In the instance of illnesses or when severe detoxification is required, however, the water requirement can significantly increase. If you do not drink enough water, the positive effects of green tea can even have a negative impact. Since the 1970s mainly in Japan, and the 1990s increasingly in the USA and Europe, the effects of green tea have been investigated in more than 2000 scientific >>studies<<. Furthermore, numerous new studies are constantly taking place. There is now a great deal of information available on the effects of green tea on a large number of different diseases, as well as on general health. The aim of this section is to summarise and explain study results in relation to individual topics, in order to make the findings more accessible to readers. In 2017, Swedish scientists at Uppsala University were able to demonstrate for the first time that tea consumption alters human genetic material and DNA activity (DNA methylation) (1). This relationship has been suspected and investigated for some time, however it has so far only been proven in vitro and in isolated cancer cells. Due to the study design, these new findings do not yet allow any general conclusions to be drawn. Nonetheless, it is clear that the new methods of future genome research will capture and uncover the positive health effects of tea in much more detail. For further details on this topic, see the article >>The Benefits of Tea on DNA<<. A Japanese study found that green tea can help with over 60 diseases and can even cure over 20. Personal experience reports even claim that it can help with an even greater number of health problems, or at least has a significant supportive effect. In the case of treating illnesses with very serious or complex causes, however, one should refrain from consuming green tea alone. This applies to all diseases, which should be thoroughly diagnosed and comprehensively treated by a doctor or alternative health practitioner. Green tea can be very beneficial, but its intake should be discussed with a professional, due to the possible interactions it may have with medicines. According to numerous studies, tea – and above all green tea rich in flavonol glycosides – helps prevent arteriosclerosis, strokes, myocardial infarction and other cardiovascular diseases. Tea consumption improves the reactivity of the blood vessels and the elasticity of the arteries. It also reduces blood pressure. Many studies have shown that tea, and green tea in particular, has a preventive effect on a wide range of cancers. In animal experiments, tea has also demonstrated a strong preventative effect on cancer outbreaks. These included important cancers such as stomach cancer, skin cancer, breast cancer, prostate cancer and lung cancer. Studies on mice showed that green and white tea inhibited colon cancer pathogens and slowed their cell proliferation. White tea was even more effective than green tea for specific types of cancer, such as colon cancer. 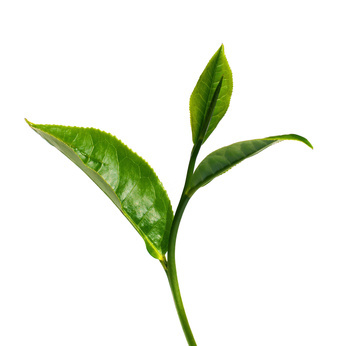 The contents of green tea help to combat cancer on multiple levels, for instance by: inhibiting tumour growth, reducing the resistance of cancer cells, inhibiting cell division, restricting angiogenesis (supply of cancer cells), limiting the spread of cancer cells and having a beneficial effect against DNA damage and on tumour markers. 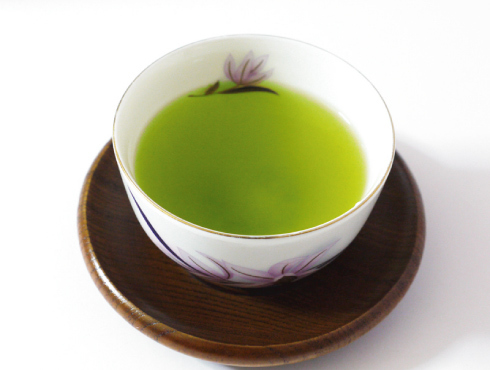 Our article >>Green Tea and Cancer<< provides further information on this topic. Several scientific studies have shown that a sufficient intake of green tea improves the lipid metabolism, accelerates fat burning, increases the basal metabolic rate and thus promotes >>weight loss<<. Tea also improves insulin sensitivity and reduces the risk of type 2 diabetes. Numerous studies have shown that an intake of tea polyphenols delay the onset of a large number of chronic diseases – such as asthma, Parkinson’s and Alzheimer’s. Green tea polyphenols are also anti-inflammatory by modulating eicosanoid biosynthesis, and antiviral by inhibiting transcriptase. The high antioxidant power of green tea is mainly attributed to the high content of polyphenols. These are able to trap free radicals and thus protect against their harmful effect on metabolic processes. The protective effects of polyphenols against certain skin diseases caused or exacerbated by sunlight have also been studied. Polyphenols protect the body against UV rays and reduce the related stress in the skin. The Japanese variety of >>Matcha<< is considered the food with the highest ORAC (Oxygen Radical Absorption Capacity) value, the unit of measurement for antioxidant capacity. In naturopathy, acidification is said to cause/be instrumental in, the development of gout (uric acid crystal deposits in the joints), arthrosis (prevented optimal basic supply of joint cartilage) and arthritis (additional tissue irritation due to excess acids). A regular consumption of green tea can prevent/help to remedy acidification in two ways. Firstly, especially the Japanese green tea variety Bancha has a strong de-acidifying effect (“de-acidification tea“) and, in contrast to some conventional alkaline supplements, can also de-acidify intracellularly (take effect inside the cell interior). Secondly, the contents of green tea are beneficial for the entire metabolism and support the kidneys, as well as the excretion of urinary substances. 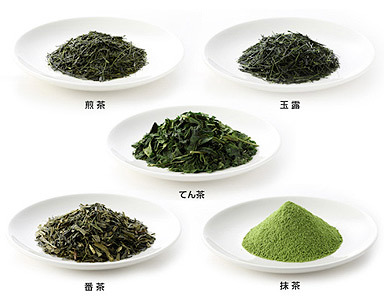 Here a combination of the varieties Sencha and Gyokuro as the main supply, plus the addition of Bancha, Karigane, Benifuuki powder and Matcha, are useful. In more than three-quarters of the 40 plus scientific studies carried out since 2000, the regular consumption of green tea has demonstrated an effect on the digestion and absorption of fat, the inhibition of certain enzymes for the absorption of fat and has increased the basic energy turnover. Green tea can therefore noticeably support efforts to lose weight. Catechins in particular (especially EGCG) and caffeine play a major role. Detailed information on this effect, application and dosage can be found in the article >>Weight Loss with Green Tea<<. Green tea has a relatively high content of alkaloids, especially caffeine (see how much >>caffeine in mg<< is in tea, coffee etc. ), but also theophylline, which is known for its stimulating effect and side effects. Few people are aware of the very positive health effects of >>caffeine in green tea<<, within a certain daily dose – as described in many studies. It should be noted that caffeine in green tea is more tolerable and effective in its interaction with other ingredients than other caffeinated beverages such as coffee or other teas (except white tea). However, every human being has a different level of sensitivity and tolerance to caffeine, which is natural and determined by health influences. An excessively high dose of caffeine can have an unpleasant and stressful effect. 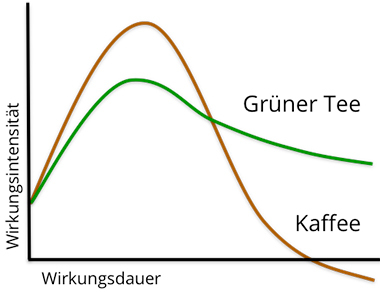 It is therefore important to know in which tea type how much caffeine is present, how well it is tolerated and the impact of the preparation method. 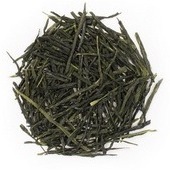 For example, varieties Chinese Green Needles and Mao Feng show the highest level of caffeine; Chinese Gunpowder and Japanese Gyokuro, relatively high; Japanese Sencha, medium-high content; Japanese Bancha, much lower; Sencha Karigane contains hardly any caffeine and Sannenbancha almost none. It is now also crucial to take into account the L-theanine content of the respective teas, as this significantly reduces caffeine’s impact. An overview of the caffeine/theanine content by tea type can be found in our article: >>The Caffeine Effect According to Tea Quality and Variety<<. It should furthermore be noted that caffeine dissolves more intensely in water when the brewing time, temperature and amount is increased. Even a second or third infusion still contains a lot of caffeine. Green tea is a collective term for all >>tea varieties<< that originate from the tea plant Camellia Sinensis and where the oxidation or rather fermentation is stopped after harvest. This can happen in different ways. The majority of Chinese and Indian green teas are roasted at high temperatures (250-350 °C), while almost all >>Japanese green teas<< are briefly steamed at relatively low temperatures. Unfortunately, green teas lose a significant portion of their temperature-sensitive ingredients through roasting, for example their amino acids and heat-sensitive vitamins. This reduces the harmony and compatibility of the active ingredient mix. However, many of the important bitter substances and catechins are retained. This aside, the green tea plant creates and stores the different groups of substances in various amounts in its different components (buds, leaves, ribs, stems). In this way, buds and young leaves have considerably more catechins, caffeine and certain bitter substances than older leaves. They are also considered to be finer, tastier and more valuable. It should be added that green tea can be harvested several times a year. The first harvest contains most of the minerals and special nutrients that have accumulated since the last harvest the year before. How often a tea garden harvests and “exploits” its plants during the year is an important factor. Good quality teas are only harvested twice per year, special qualities, only once. Organic cultivation in particular should be harvested less often, preferably only once a year, as the plant grows more slowly and requires more energy. Many high-quality tea farms in Japan only use small amounts of pesticides anyway; from the consumer’s point of view, it is often not necessary or sometimes even disadvantageous to buy organic products. Another aspect is that the later harvests grow faster and therefore develop more catechins. For example, the youngest leaves of the third harvest have many specific catechins. The shading of certain Japanese teas before harvest (Gyokuro, Tencha, Matcha) should also be emphasised. This results in a higher content of amino acids, while less bitter substances (catechins) are formed. The green teas considered to be finer, such as the Japanese varieties >>Gyokuro<< and high-quality >>Senchas<<, are made from the younger buds and leaves of the first harvest. 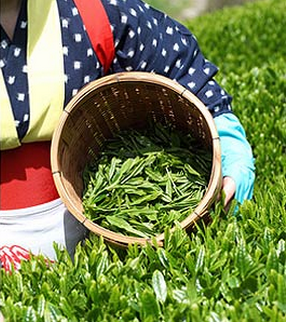 >>Shincha<< is the very first harvest of the year and only the tenderest buds and leaves are collected. >>Bancha<< consists of coarse, older leaves and Kukicha or rather >>Karigane<< mainly from the stems of the plant. Benifuuki is a cross between the varieties Assamica and Sinensis and forms especially methylated catechins. Accordingly, these green teas have different ingredients and a significantly different effect. In addition, different cultivation and production methods also provide other ingredients. Traditionally, green tea is consumed in the form of a tea infusion due to the usually good water solubility of its ingredients. In Japan, the so-called Uji or Sencha method was developed very early on, which uses a certain rolling process to break down the leaves more strongly after harvest, making the ingredients more available. Most green teas in Japan are processed according to this method. Another very traditional form of preparation is the fine grinding of the leaves to produce tea powder. 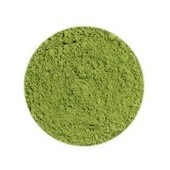 The powder made from the variety Tencha and sometimes Gyokuro is called >>Matcha<<. Other ground varieties are called Micro Cha (Micro Tea) . According to the traditional tea ceremony, Matcha is also infused with hot water and stirred with a bamboo whisk. Here however you do not only consume the tea water but the whole liquefied powder and with it the whole tea leaf as well. The insoluble tea contents are thus also consumed. The fine powder structure also increases the absorption of certain polyphenols. Matcha powder is also very tasty in cold drinks such as in green smoothies or shakes with rice or almond milk, which serves as an excellent complement to the tea infusions of other varieties. In addition to Matcha, Sencha powder and >>Benifuuki powder<< also deserve special mention because of their health effects on allergies and the metabolism. In addition to these dosage forms, green tea extract in capsule or powder form has also been available for several years. The aim here is to provide the highest possible concentrations of the much discussed catechins. Green tea extract can be a very interesting supplement to the other intake forms. For instance, it is especially helpful for serious illnesses or to support weight loss. In contrast to the above-mentioned forms, there are many green tea trend products on the market, from soft drinks to ice cream. In regards to these forms, it is important to be aware that they are often manufactured with very cheap and poor quality green tea, the contents of which have often degraded through processing and long storage. Therefore, no significant health effects are to be expected from such products. Nutrient supply: Important >>vitamins<< and many >>minerals and trace elements<<. Especially noticeable for eye sight, teeth, metabolism. These substances can be absorbed by eating the leaves after the infusion (especially >>Bancha<<) or through drinking >>Matcha<<. Caffeine is bound to tannins and in contrast to other caffeine-containing drinks (coffee, black tea, oolong etc. with the exception of white tea) is much more tolerable due to the abundant L-theanine (amino acid) and very healthy in certain amounts per day. Caffeine in green tea is stimulating and has a beneficial effect on concentration, learning ability and stamina. It is also beneficial for the cardiovascular system, central nervous system and brain functions. >>Tea polyphenols<< – i.e. bitter/tanning substances and secondary plant substances, including >>catechins<<, flavonols, saponins, essential oils. These have a particularly positive effect on the metabolism, especially on: the liver, leading to a higher basal metabolic rate, reduced fat intake and supporting >>weight loss<<; detoxification and excretion, especially strengthening for the kidneys; digestion, particularly beneficial for the small and large intestines; and inflammatory processes in the body. Green tea is also an alkalising agent and is therefore helpful if the acid balance is too high. >>Amino acids<<: green tea contains large quantities of very important amino acids with outstanding health benefits. Green tea is considered to be one of the most reputable means of maintaining health and preventing disease, not only because of its special ingredients, but also because of its bioavailability, combination and interactions. The latter aspects are particularly important, as it is not only the monosubstances and their quantity that are decisive. What would be the use of healthy ingredients which, according to laboratory analysis, are contained in recommended amounts but can only be absorbed by a fraction of the body due to poor bioavailability? And more importantly, certain substances owe their strong health effects only to their combination with other substances. Furthermore, the above-mentioned aspect of nutrient supply is all the more important since many people do not eat healthily and many foods do not contain sufficient amounts of nutrients. Appropriate dietary supplements are often difficult to find (in terms of quality, purity, bioavailability, range) and expensive. For a good health effect, a certain quality of tea should be purchased. Read our article >>Tips for Purchasing Green Tea<< to find out more. Green tea is often regarded as one of the most universally applicable medicinal plants, taking into account the above-mentioned criteria. There are certainly numerous plants that have greater effects for specific areas of application or diseases, but in view of the enormous number of scientific studies, there is hardly another plant that has such a strong general effect on health and can be taken long-term.